Hello my fans and friends back again eh? Its been a good week though I must say; almost a good week… it ended in disaster. But we England gave the Australians a good beating in the Rugby World Cup then we gave the pathetic Frenchies a good fine line thrashing in the semi’s and indeed that is what I was left with. Which was a joy to behold… the result that is… not my semi. But then again beauty is in the eye of the beholder. Now I’m not going to mention the final. Why should I? Why would I want to? Bloody South Africans caffer hating boars. Anyway. And I mean bores as in bores not boars as in boars. But anyway the mighty Gunners went back to the top of the Table and they are staying there. England won a cricket match on foreign soil. Well in fact they won the series in Sri Lanka. The first English team to do so ever. Amir Kahn is progressing well and has become a very big inspiration to Abdul who has taken up the art of fisty cuffing and young Lewis Hamilton was in Pole position to win the F1 motor racing championship in Brazil… even though he didn’t finish in Japan. 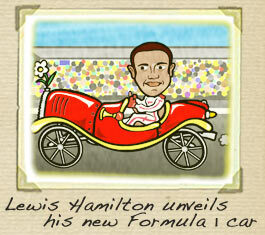 As I write, sadly the young Lewis has just failed to win the said championship. I think it was the South Africans playing with his brakes… They don’t like caffers as I say and they don’t like the young genius that is Lewis. Sad but true… And I know Hansie Cronje was involved, I know he had a bet on. That is why so many of the South Africans come over here for they don’t like the jungle. They don’t like the bushmen and the flies. They don’t like them and the lack of condoms. I think that is a major issue in Southern Africa the lack of condoms and I actually think that we should give them more condoms to stop the South African breeding because it is an issue and that is why they keep winning the World Cup. And if it had been for condoms Shaun Pollock would not have been born because I know that Graham Pollock is a very religious man and he couldn’t get hold of any condoms so unfortunately he unleashed the ginger man that is Shaun Pollock. And we all know that Shaun is a good friend of Eugene Terblanche the right wing protagonist. I was there watching England play on that cricket match series which took place in Sri lanka.and I’m glad England won the game and has prove itself to be the first english nation to win a match on foreign soil, there were a lot of people there even outside the stadium, before the match even started, people were told to stand in proper line to get the tickets, i don’t think all those people were inside the stadium because there was not enough tickets for all those people out there. I don’t remember Arsenal being at the top of any table in May… and if they were, what the hell happened to them? Anyway, two years later and both Arsenal and the England football team are still disappointing us.